“We must now consider the power of the ministers of this sacrament, which power depends on the keys.” - Freemason Thomas Aquinas, Summa Theologica, Q. 17, Article I: "Of the Power of the Keys"
Manipulating your belief system into the worship of fire is why the Illuminati do what they do. They badly want your soul, and this is why they must create an avalanche of “historical evidence” that leads you to conclude that a burning bush fire is the God of Heaven. On the contrary and in reality, fire is the god of Hell, so think twice and choose wisely when the time comes. By taking seriously the wise words given to us by Our Lady of Fatima, deconstructing the Jewish scribes' Bible, referencing the Protocols of the Learned Elders of Zion, studying the Masonic Pope's Manual on Freemasonry - Morals & Dogma, and cross-referencing Catholic Dogmas which exist to guide the faithful from this beast, we pinpoint certain keys in the battle between Our God Jesus Christ, and the adversary, Lucifer. The rules of the game between Catholicism and Judeo-Freemasonry lead us to one conclusion. Heresy is all that matters. Everything else is secondary- fish holidays, walking in a straight line, etc. Heresy is the battle and heretics are the horsemen. Once this is understood, how Freemasonry took control of the Vatican should make sense. So what are all of these pagan societies up to? Why all the secrecy? Why this unified front against Catholicism? What is it about Catholicism that bothers them so much? Why is the occult so preoccupied with infiltrating the Catholic Church? How were they able to succeed? What is their end game? What do the dead tell them about these doors in their rituals? In short, what is it that the Illuminati know about the process of death and judgment that Catholics don't? Above left: Lucifer is invoked at the Vatican in 2014. Above right: Lucifer is invoked at the Vatican in 2015. The answer is in the mysterious doors that await you upon your death. Jesus Christ gave the keys to the doors to Heaven, long ago to St. Peter. But over 20 centuries of Church corruption, Lucifer and his legions of false priests infiltrated the Church and took these keys away. The mysterious question at your Judgment is in simple terms, “Is Jesus Christ your God?” The simple answer is: if Christ is your God, you'll be spared from Hell. Giving the wrong answer: “The son of the Lord” (Satan).. is what the Illuminati want you to do. Denying the Divinity of Christ is called heresy and those Freemasons who initiate themselves as heretics, which is not coincidental, have an obligation to the Devil to promote the Lord of the Bible as the God of Heaven over Christ who is God the Son, the Holy Ghost who is God the Father, and of course Our Lady who is God the Mother. This is because the First Commandment of the Bible's burning bush fire Lord is not to have any other gods above him. The Dogma of the Catholic Church infallibly teaches that heresy is the gates of hell. Freemasonry initiates all of its candidates dressed as heretics. This is no coincidence. Occultists know that all non-Catholic heretics go to hell, actually condemning themselves with their false knowledge. That's why the occult promotes heresy, which benefits their Master, Lucifer. Highest level Freemasons are aware of this question of Judgment, but most Catholics are not. By altering the Liturgy, Mass, Sacraments, and icons of the Catholic Faith, Freemasonry has achieved its objective of delivering souls to the Devil. Masonry has unsuspecting Vatican Priests believing they are marching under the keys of Peter when in reality, after 1969, they are worshipping a hallowed father, baptizing in Baphomet, and following a Jesus that is the son of David. Those Catholics who failed to notice will lose. Those who fight stand to do better. Those who don't know but follow Our Lady of Fatima's directions to say the Rosary everyday will fare a bit better. But the harsh reality is that today, the only true religion, no longer exists as an official organization after the Vatican II Council (1959-1969). Up until its return in 2009, Catholicism had completely vanished, just as God the Mother warned us when she said the Church will be in eclipse... and this is the mystery of the Apocalypse. “The Initiates ought to understand this, and, lest the profane should overhear, Masonry never says too much.” - Albert Pike, Pope of Freemasonry, Morals & Dogma page 732. What the Devil really wants is the grand prize, the Catholic Church, the only organization equipped to put up a fight. But the Devil doesn't want to destroy the Church physically, he wants his men to infiltrate it and change the Mass and the Sacraments in such a way that it actually becomes a machine for Hell. He wanted it done in such a way that most of the world would go along with it under the cover of ecumenism. The world would then worship the Devil's son, the Ecclesiastical Jesus and actually worship this highest level initiate instead of God the Son, Jesus Christ. The Catholic Church would actually start baptizing infants with the mark of the beast, the spirit of the one who is coming, the anti-Christ. This is the severity of changing the Mass and the Rites, the fruits of Vatican II's Revolution. 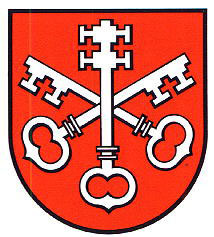 The Novus Ordo Council was the final act in Jewish Freemasonry's revolution against God. It is important to realize that this has already happened (except for a few of us who have the evidence of how the texts were changed). So how did Judeo-Freemasonry pull this off? Contrast these pop-culture, common Freemasons with a 'Brother' who actually infiltrates the priesthood. Over his 40 years as a priest, he manages to baptize 10,000 souls invalidly, anathematizing them. Obviously, he sacrifices wealth, power and or fame in this lifetime, but this Freemason decides for himself that having a higher seat in Hell is worth more than a good time in this world. And, he's not just another junkie pagan mystic, he's working for what Lucifer really needs to complete the New World Order: he needs the Catholic Church to go along with the Devil's designs. After all, this priest realizes life is short and eternity is forever and undercutting the Rock is his best chance for eternal glory. Once in Hell, this priest will have 10,000 'prisoners' under his jurisdiction (if the Devil keeps his promises). Since this Masonic priest has done better for his Master by condemning more souls by posing as a real Catholic priest, he expects a greater reward, a higher positioning in the pyramid of Hell. This Masonic “Great Work” of infiltrating the Catholic Church, the destruction of Christ's Seven Sacraments (opening the Seven Seals), replacing the Holy Sacrifice of the Mass with the daVinci Jesus' Lord's Supper Show, destroying all Catholic Altars and replacing them with Masonic tables, (the Lion of the tribe of Judah), we begin to understand how the Jews pulled off this Apocalyptic eclipsing of their enemy, the Catholic Religion. Satanic Jewish Freemasons have been operating since the Church began, and it has taken thousands and thousands of false priests to change the original Catholic religion into Satanism. It took almost 2,000 years to destroy and usurp the Catholic Church, but their task is completed now. Humanity will be judged harshly for allowing this to happen, and humanity will suffer the consequences. So how did this happen? Well, do you have any priests in your family looking out for you? Since you probably don't, you shouldn't complain when someday you're excluded from Heaven because some stranger you trusted with your family's souls did not baptize your kids with the proper intention, rendering the precious Sacrament invalid. If you don't reform, you will only have yourself to blame for not taking these matters seriously. In Matthew 16, the Bible, penned by occultist scribes, intentionally gives the wrong answer that leads so many to Hell. 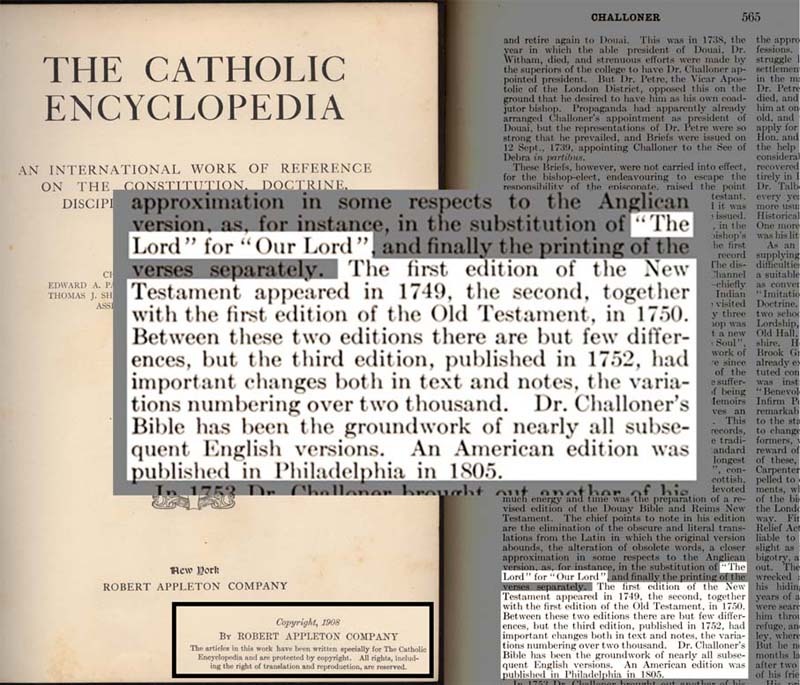 These passages are erroneously promoted as the founding scriptures of the Catholic Church, but there's just one glaring problem: these Bible passages were penned years AFTER the Catholic Church was founded. 16:15. “Jesus” saith to them: But whom do you say that I am? 16:17. And Jesus answering said to him: Blessed art thou, Simon Bar-Jona: because flesh and blood hath not revealed it to thee, but my “Father” who is in heaven. 16:18. And I say to thee: That thou art Peter; and upon this rock I will build my church, and the gates of hell shall not prevail against it. 16:19. And I will give to thee the keys of the kingdom of heaven. And whatsoever thou shalt bind upon earth, it shall be bound also in heaven: and whatsoever thou shalt loose on earth, it shall be loosed also in heaven. 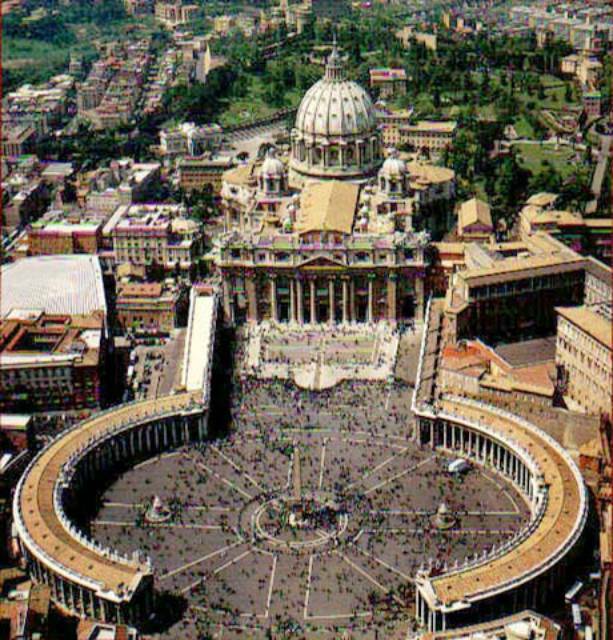 The Vatican courtyard is shaped like a key. The gates of Hell are the consequence of following heretics. Our Lady at Fatima indicated that the Rosary is a powerful weapon against heresy and a certain “door” by which to enter Heaven. So when studying judgment, we find keys, doors, gates, and names. As Shakespeare asked, “What’s in a name?”, we find overwhelming evidence indicating that names are critical factors in determining whether one goes to Heaven or Hell. The job of the Roman Catholic Church is to hold these Keys to Heaven's Doors. But sadly, they haven't, which is why Our Lady appears to certain people, to give the remedy to this problem: Her Rosary. If you were to say, “You are the Son of Our Lady, the Mother of God” as a Catholic should instinctively answer, you would imply that Jesus Christ is God, and that is the correct key. But if you were to give the Masonic biblical answer, “You are the Son of the Lord, the Father,” (Matt. 16:16) or the Muslim answer, “You are just a prophet of the Lord,” you would find yourself in heresy and embarrassed for getting such a simple answer wrong. That would be strike two. If you were baptized in the name of the Holy Ghost, as the Council of Trent orders for all time, your sins “will be forgiven” as St. Augustine teaches, but in time, perhaps. 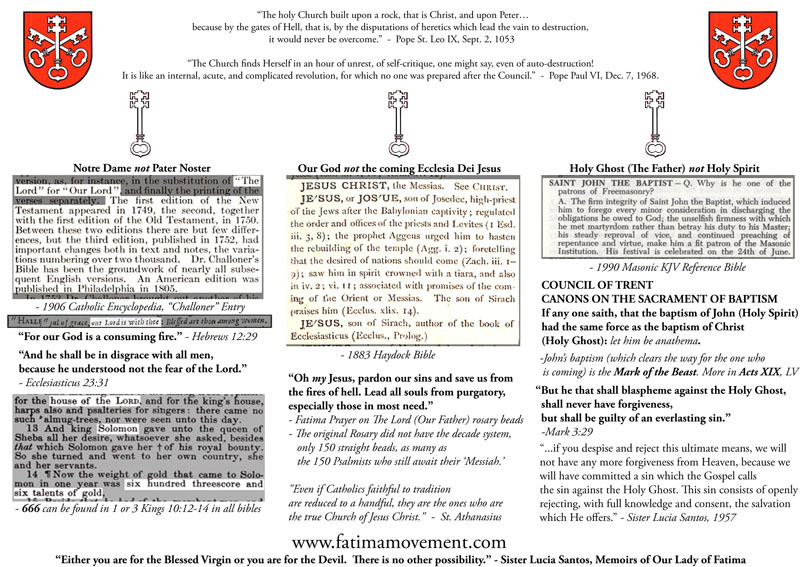 However, since Judeo-Masonry changed the name of the Third Person of the Trinity in the Latin version of the baptism rite in 1777 (1944 in English), you will find that you are not baptized Catholic, and that is strike three. So this becomes quite the problem now. You don’t know the Catholic Faith- that Jesus Christ is God, you realize that the Lord is a hallowed or empty name and definitely not God, and then you are shocked to find out that you weren’t baptized correctly as an infant because no one in your family was able to preserve the Name of the Father of the Catholic Trinity- The Holy Ghost, or that your Priest did purposely withheld the required intention to baptize you Catholic. And now you find yourself in Purgatory or Hell until Judgment Day, with only yourself to blame. As you count your days in Purgatory or Hell, all you can do is watch as your unbaptized descendants, who are also deceived by Masonic priests, unknowingly follow their Masonic “Priests” into Hell. The term “sins of the father” starts to make sense, but you can do nothing because your time to take Our Lady's warnings to reform yourself spiritually has expired. Our Lord: “You have the time, you will have the power. This apparently happened in 1884. This event provoked Freemason Antipope Leo XIII to add a new section of the heretical Catholic Mass called the Leonine Prayers after the Low Mass. Click on this link for the Masonic 1962 Mass which contains this addition, contrary to the Papal Oath to not add or take away anything handed down by Tradition... It is noteworthy that the 'Lord' indicated that he needed 75 to100 years to complete the destruction of the Church. 75 years after 1884 was the year 1959, and on January 25th of that very year, Freemason John XXIII summoned the start of the Second Vatican Council. The mostly subverted Mass (pre-1962) vs. the completely Masonic 1969 Novus Ordo (New Order) Mass, created at the Second Vatican Council.